2016 Sponsorship Opportunities Now Available! 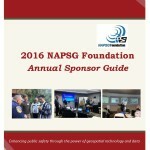 We are pleased to announce that the 2016 NAPSG Foundation Annual Sponsor Program is now available. For 2016, we have introduced new benefits to our Sponsor Program that increase the return on investment for participating companies. We understand the important role that the private sector plays in meeting the needs of our public safety and GIS community. Our sponsorship program provides an opportunity for companies to support NAPSG and our sponsors’ shared goal of serving the community. NAPSG Foundation is a 501 (C) (3) charitable nonprofit. All contributions are tax deductible for US taxpayers to the greatest extent allowable by the Internal Revenue Service. Click on the image below to check out the 2016 Annual Sponsor Guide! We are pleased to release the Report on Survey Results: Incident Symbology. This report provides a summary of the results from the national Survey on Incident Symbology and Mapping Capabilities conducted by the National Alliance for Public Safety GIS Foundation (NAPSG). The purpose of the survey was to determine a baseline understanding of the level and usage of location-enabled decision support tools and standardized incident symbology. This study serves as a primary input in determining priority gaps and areas for improvement that are critical to establishing a common symbol dictionary for communicating preparedness and incident information across the entire public safety and homeland security community. The analysis in this report extracts and shares the actionable results from the national survey. The analysis concluded that existing incident symbols are not entirely adequate or effective in supporting decision making by public safety, and there remains numerous areas for improvement in filling unmet gaps and enhancing the elements and features of existing symbols. The results illustrate that much work is still needed to harmonize and standardize incident symbology due to the diversity of standards and guidelines being used — as well as the known inconsistencies between them. Inconsistencies such as these have the potential to lead to significant operational coordination issues when multiple agencies share maps and use them in the planning and response to emergencies. To gain access to NAPSG’s existing Incident Symbology Guideline and Symbol sets Click Here – and stay tuned for updated incident symbol resources that will be released in September 2015!